Many common plants borrow the name daisy - Shasta daisies and gerbera daisies, for example - but 'true' daisies are in the Bellis genus, which translates simply as beautiful. Some gardeners know them as weeds in their lawn, but when grown intentionally, daisies have a lot to offer. 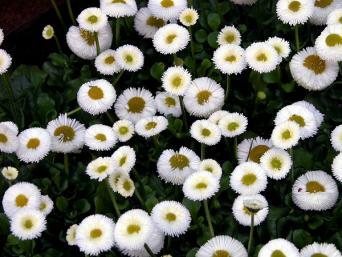 Also known as English daisy, the common lawn daisy with its tiny white petals and yellow button-like center are only the tip of the iceberg when it comes daisy flowers. The improved cultivars are not at all weedy and have much bigger and more colorful flowers. Some are so thick with petals they resemble little pom-poms. The common lawn daisy holds its flowers low to the ground, an adaptation that allows them to escape the blade of the mower. The ornamental cultivars, however, send up flower stalks six to 12 inches high. Daisy leaves are fairly non-descript ovals about an inch in size, but they do form an attractive dark green backdrop beneath the flowers. 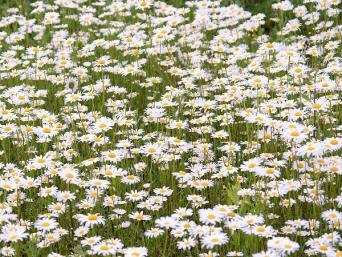 Daisies flourish in cool weather and prefer full or part sun and ample moisture, as long as the soil is well-drained. They are not picky about soil type and will grow quite well in places with low fertility. 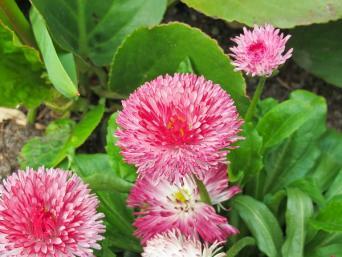 English daisies are perennials, but they can also be used in annual beds. They are easy to grow plants that can be grown almost anywhere in the country. In hot climates, they are commonly grown as a cool season annual with plants like pansies and snapdragons. In cool climates, they will flower from spring through fall. They are an excellent choice as a low growing groundcover among spring-flowering bulbs, as they will conceal the foliage of these plants as they fade. They can be planted as a lawn alternative over extensive areas or mixed with other small groundcovers like violets, creeping jenny, yarrow, and alyssum for colorful vegetative carpet - an especially lovely effect in the light shade of small flowering trees. English daisies are also an easy additions to potted arrangments, where they are useful as a low-growing accent beneath taller perennials. Nurseries sometimes sell daisy transplants with the bedding plants, but most gardeners grow daisies from seed. They germinate readily in cool temperatures - fall is the best time to sow them inn warm climates, but in northerly locations, plant the seed as soon as the ground can be worked in spring. You may start them in flats of potting mix, if you wish, but they can also be broadcast directly where they are to grow. Just loosen the top few inches of soil and rake the surface to a smooth texture, breaking up heavy clods in the process. After broadcasting the seed, rake them very gently into the topmost layer of soil to cover them. Keep them moist and they should germinate within a week or two. Daises need weekly irrigation and the dead flower stalks should be periodically removed. If growing daisies as a groundcover over a large area, go over them with a lawnmower at the end of the season to remove the last of the flower stalks and keep the patch looking uniform. One of the loveliest things about daisies is that they are virtually never bothered by pests or disease. 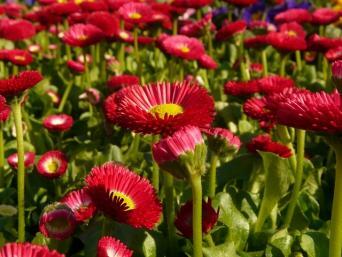 In addition to the traditional white variety, daisies come in a range of warm reds and pinks and are most often sold in mixed seed packets. 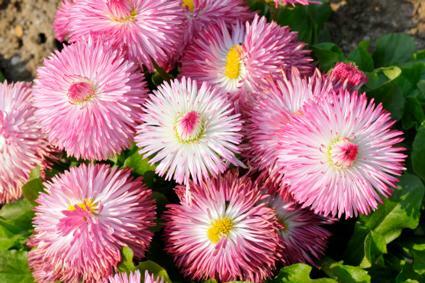 Bellisima mix contains crimson, white and pink daisies, all with two-inch flower heads. Strawberries and Cream has tightly packed tubular petals that are white on the edges, fading to deep pink in the center. Habanera has fine fluffy petals that are white with pointy red tips and red center. Tasso Mix contains numerous shades of red, pink, cream white, and yellow. Daisies are one of those plants that children seem to gravitate towards. Their flexible stems can be woven into headdresses for young princesses and they flower so abundantly that there are always plenty to harvest for daisy chains or bouquets, without making a dent in even a modest size daisy patch.